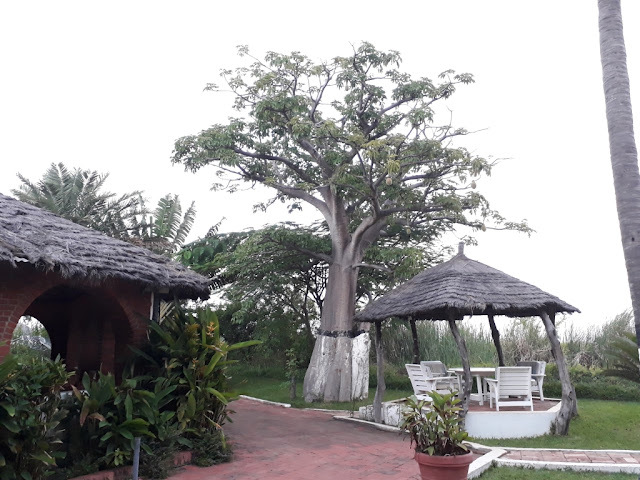 I often have to travel to Africa for work, which should be perfect for the plant addiction. Sadly between the location and pressures on time it never quite gives the tourist or plant opportunities. 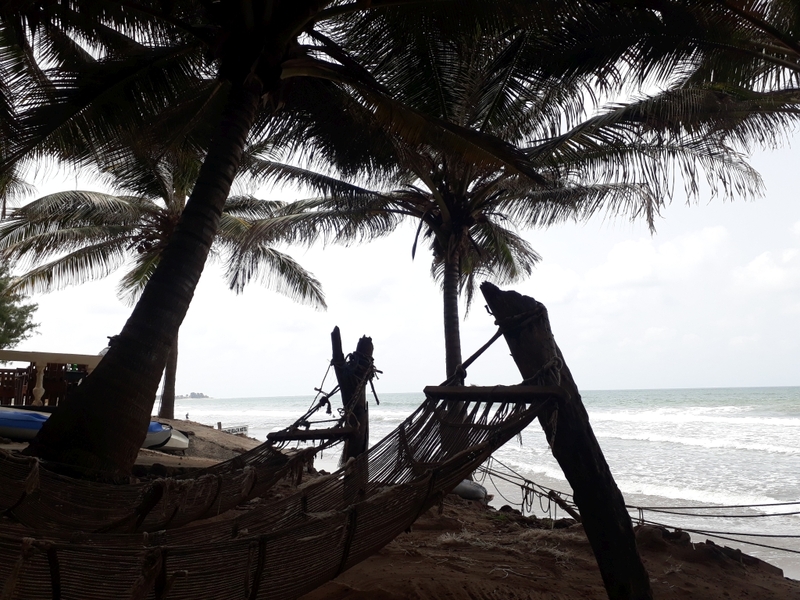 The latest trip was to The Gambia which was strange for several reasons; firstly two other people were going as well (I have always been on my own before) and the research centre was right next to a beach. 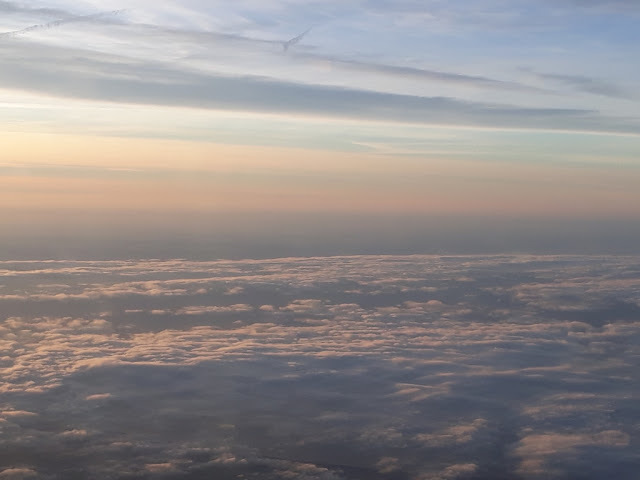 The flight was actually the highlights scenery wise. Flying over desert is usually pretty spectacular if you happen to be looking out of the window. The flights meant there was time for a quick trip to the beach. 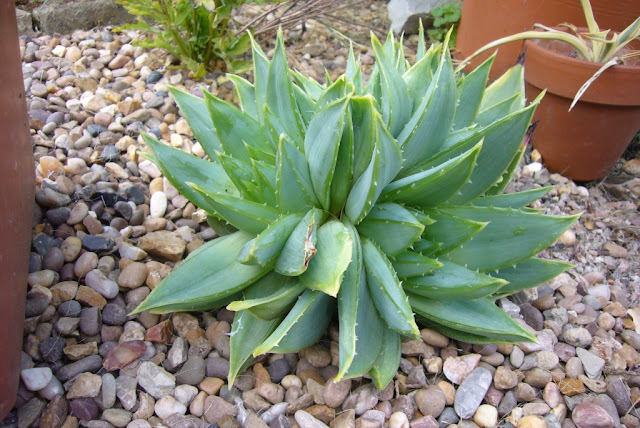 There is a list of plants I dream of seeing in habitat, mainly aloes. 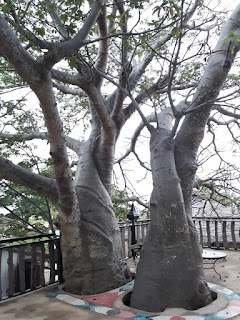 One that is right up there are the ancient boabab trees. For me these are one of the iconic views of Africa. So I was a little surprised to find this walking around the office. I managed to track down someone who knew that it was planted shortly after the research centre opened. It should be there for generations of researchers to enjoy. Even at this size there was something special about it. Boabab juice is a stapple for locals and it was fruiting season. After a couple of days I started to notice trees and fruits all over the place. Sadly they are not the massive 1000 year old trees you see in photos. I didn't get out of the capital so it was hardly a representative sample. 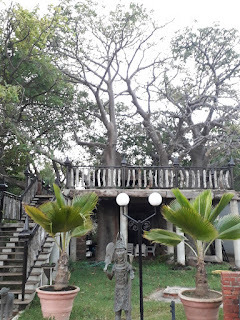 Some of the more touristy places make the most of their trees. I'm guessing that as these mature the floor of the tree house is not going be quite as flat. Mind you that will probaly not be for a hundred years or two. While it was great to see my first boababs, these are not quite the specimens I dreamt of. So can't cross that one off the list quite yet. We all have those elusive plants, that torment you from a far. 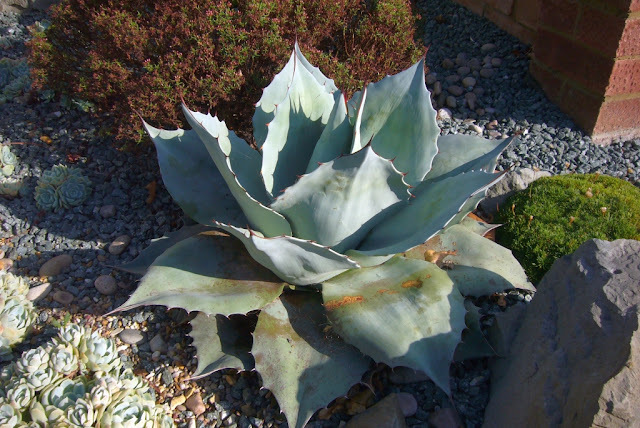 One of mine, was agave titanota black and blue. Always loved the various titanota forms (true and false). A blue form, with very dark almost black teeth was going to make it to the wish list. After a few years it has finally arrived in Europe in larger numbers. When a little one turns up, you have to go for it. It may be a while before it reaches it's full potential. 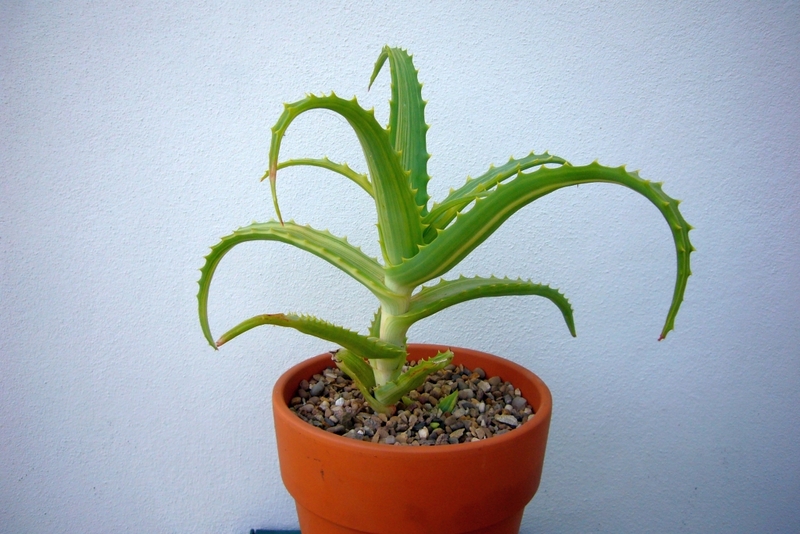 So it has been a month since the last aloe polyphylla update. A few heads have been removed to try and root. This seems to be a slow process, time will tell what happens to them. The remaining heads will be left, at least for this year. There are 6 still attached to the original plant. All except for one of the oringinal leaves have been removed and I'm pleased to say it hasn't slowed the growth. I'm going to leave it in the ground for another month, then dig it up to protect it over winter. In a couple of years, it should be big enough to plant back out again. 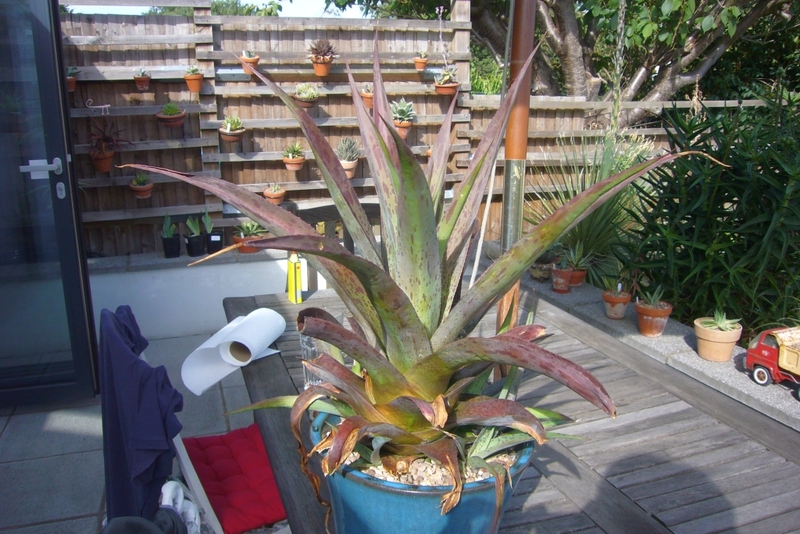 A 6 headed plant is going to need a LOT of space! 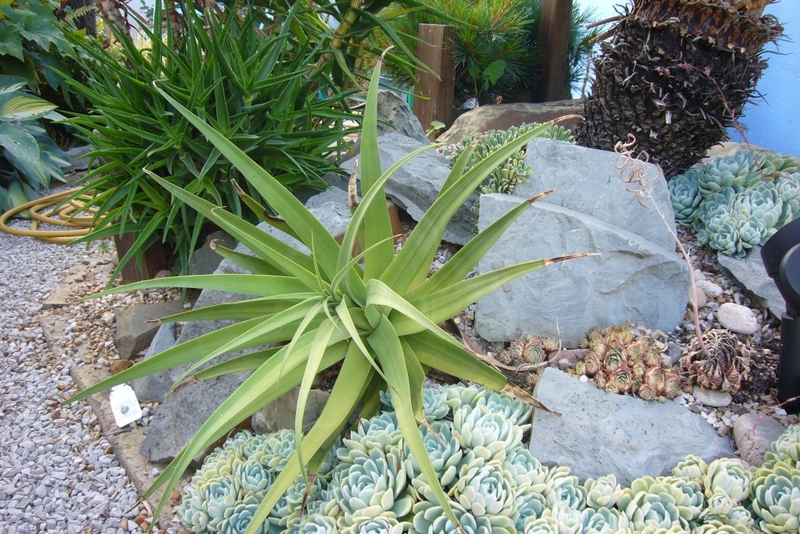 Anyone who grows succulents knows that many are easy to propogate and you can quickly go from a single plant to a clump. With many plants we expect that and make the most of it. 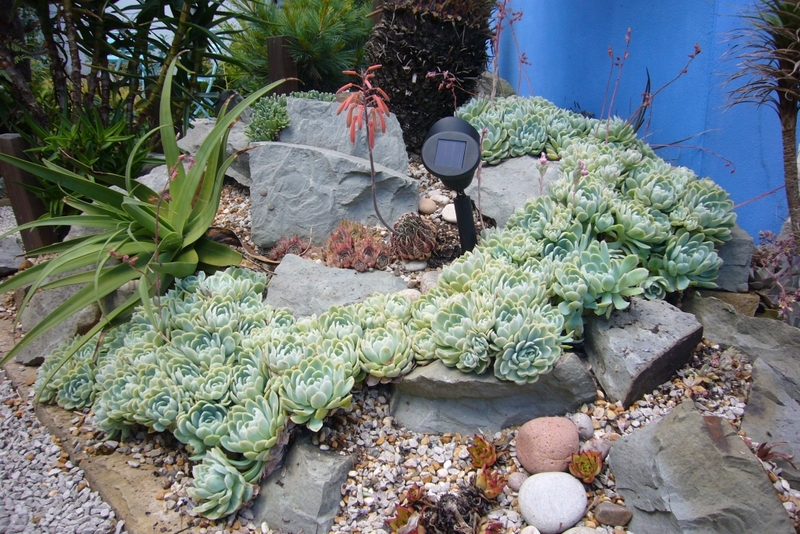 The stream of echeveria elegans in one of the rockeries started as a series of individual plant, look at it now. 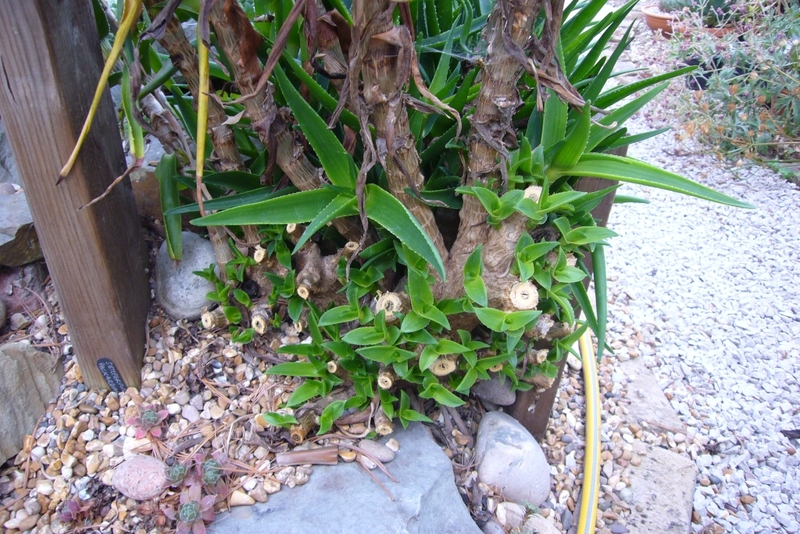 This clumping habit is something desired. Then there are the plants that we wish were a little more controlled but we know divide, or send out multiple shoots. 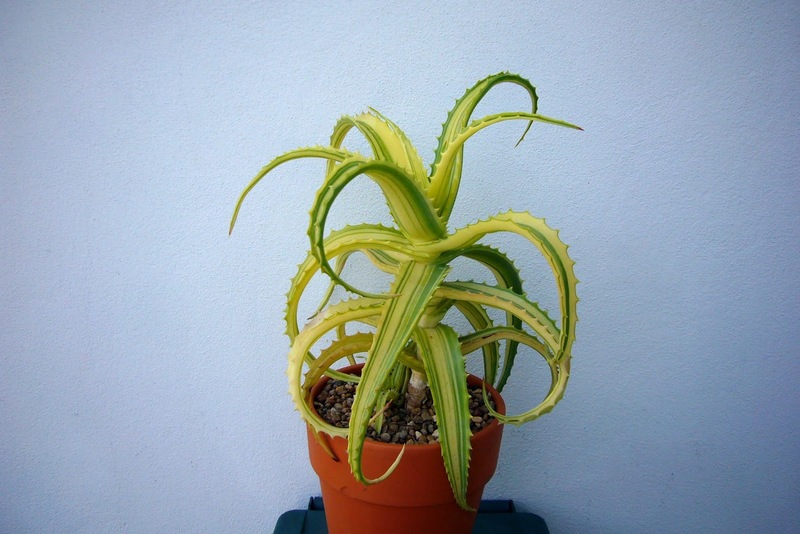 Aloe striatula would be the main example of that in my garden. I am constantly having to cut off side shoots to try and keep it under control, look at all that new gorwth. I live in London, I shouldn't have to worry about an aloe out-growing its location! But then we know this is what it does so it is to be expected. Then you have the surprises. 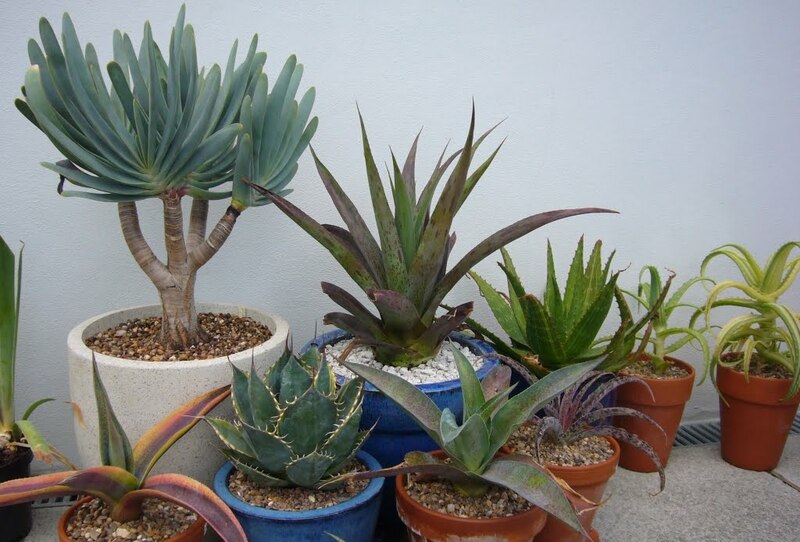 Some plants may be known to offset, but you don't think about it, or at least you expect them to be well behaved. 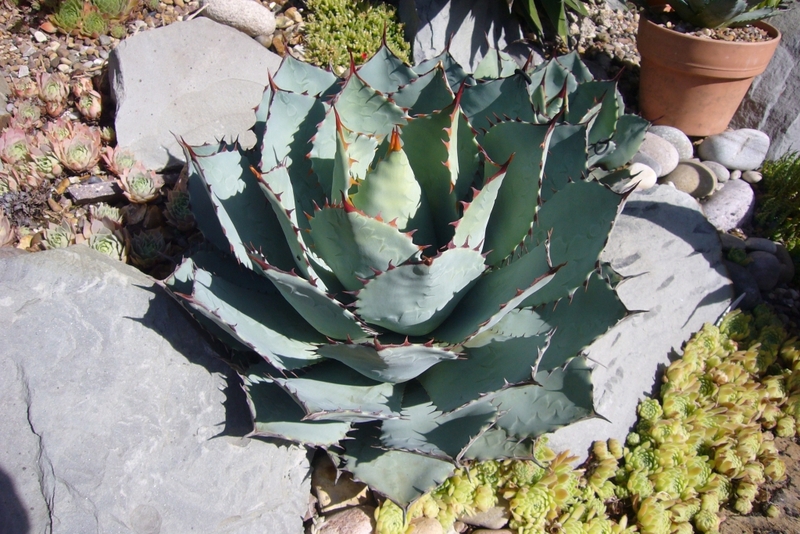 Agaves would fit into that category; I expect offsets on some of them, want them in fact, but never expected them to become a problem. 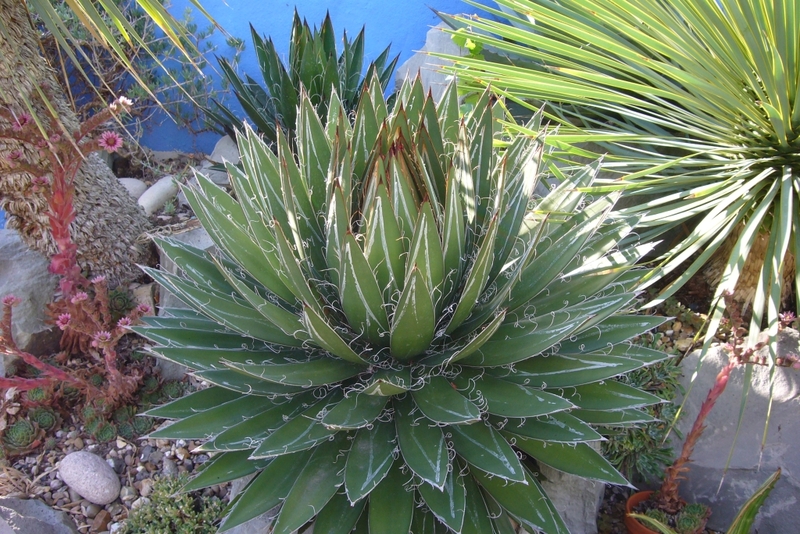 Enter agave bracteosa. Firstly it is prolific. The odd offset is fine, I do not need 10 or 20, especially as it seems to like London and be growing at a good rate. Then to add to the issue, it seems to view gravel and rocks as no barriers to trying to take over the entire rockery and is sending out runners that come up in all sorts of locations. How? Why? I have given away many of these and pulled up many more. It seems every time I look closely under rocks or plants I find new offsets. 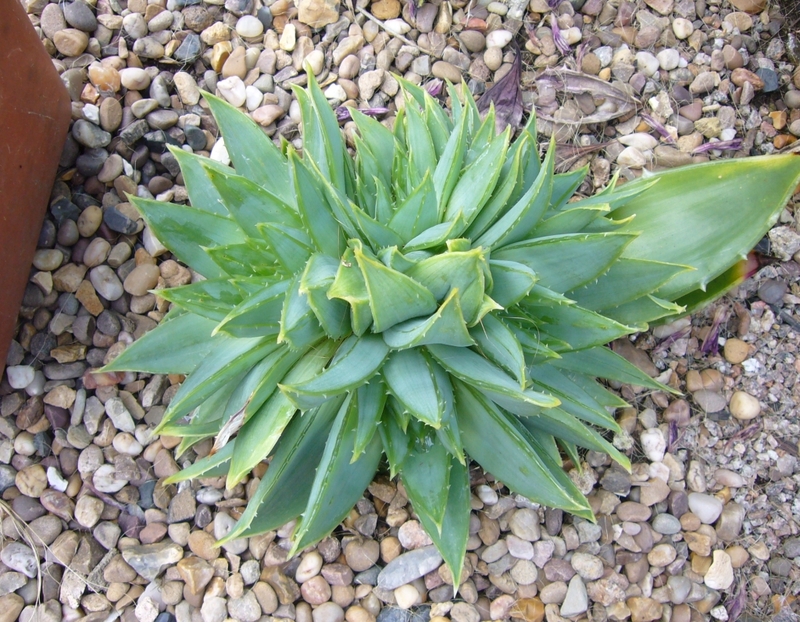 I don't get actual weeds in the rockery, instead I spend my time pulling up agave bracteosas. Perhaps to be expected, it is probably behaving as it would in the wild, after all it is known to be one of the best for Uk climate. 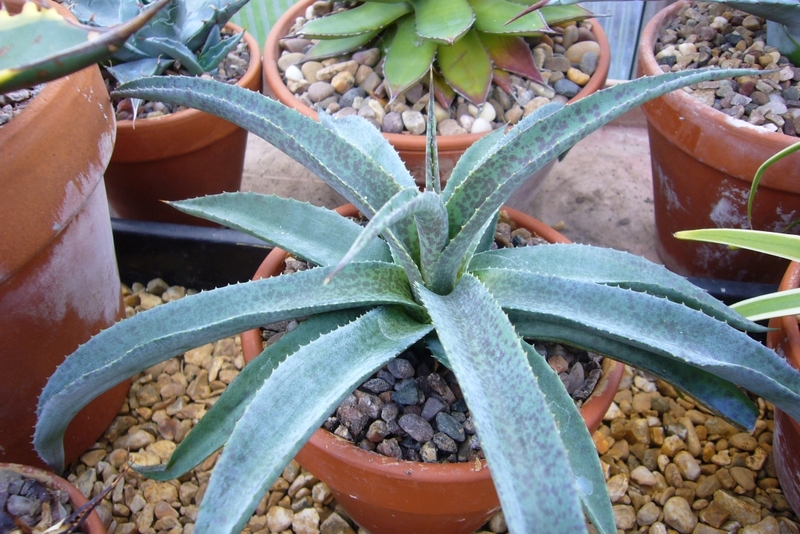 Aloes on the other hand are not known to be well suited to UK winters. There are limited numbers that can be planted out and so it was a surprise that a variegated aloe saponaria survived at all. Each year it gets better and I posted a little while back that I had to move the clump it had formed. 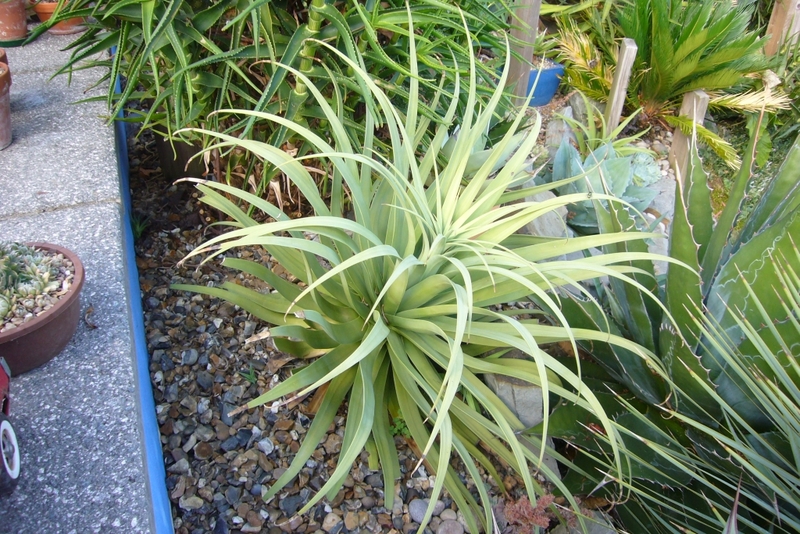 The best variegated plant I re-planted in a better location has grown nicely. But we are not here to celibrate the plant or it's clump forming habit, this is another one that likes to explore. For the last couple of years I have found this coming up further and further from the original clump and it was starting to become a problem. 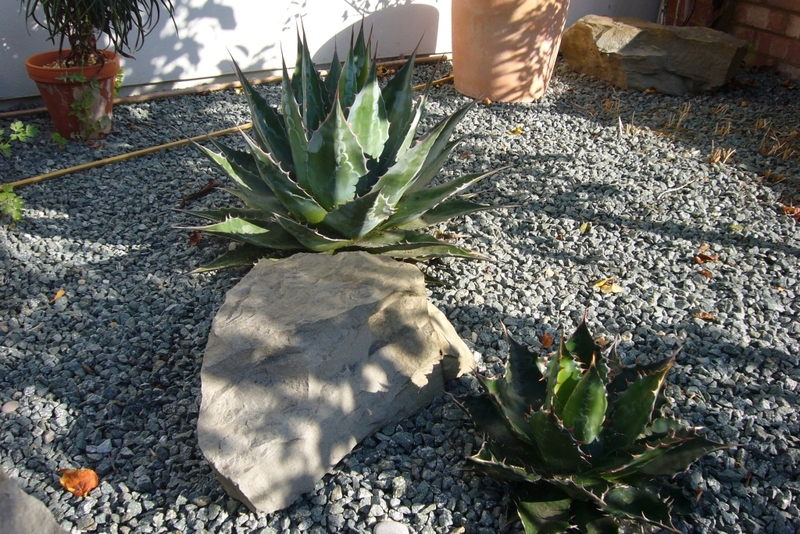 The cactus had to be dug up to remove the runner and this was only one of the areas they were appearing. 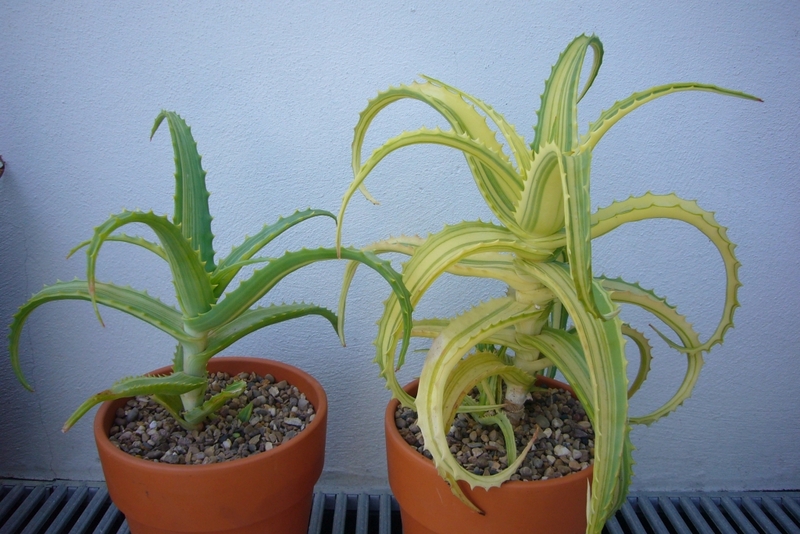 This is the UK, I do not expect to be over-run by wondering aloes. So does anyone else have problems with unexpected wondering plants? 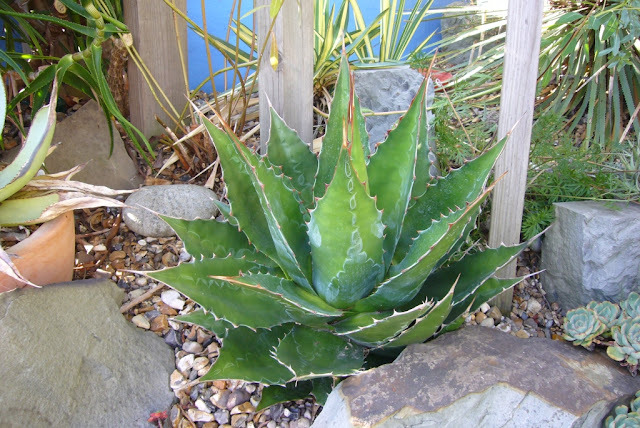 After my potted post on some of the potted agaves (here) and having seen the agave report on the blog Piece of Eden (you can read it here) I thought it was time for one on the planted agaves in various rockeries. I have tried to limit the number of varieties especially as they do not get protected over winter. 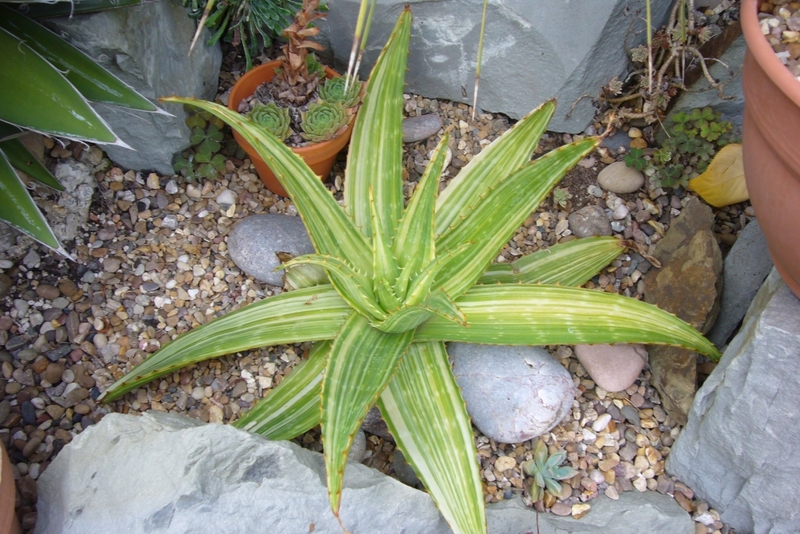 There are two of these in the main rockery and two it the front. The largest was one of my first planted agaves, it was one that was moved from the old garden. 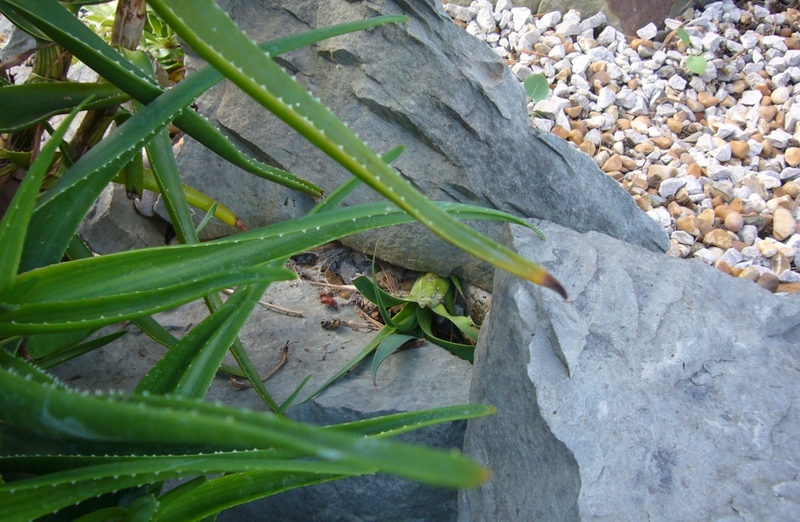 The second had a bit of a tough start to the year, as it was covered by the aloe striatula. Back in the sun again, it seems not to have noticed. The two in the front are much slower growing. They don't get fed, or watered and don't get as much sun and it shows. You can see the smaller one is very shiny green. It looks a little different to the rest and I wonder if it had a bit of Gentryi mixed in. It was the reason I bought it, time will tell. The other plants that were dug up and moved from the last house are agave filifera. The largest one seems to have stopped getting bigger and now is just increasing in height. 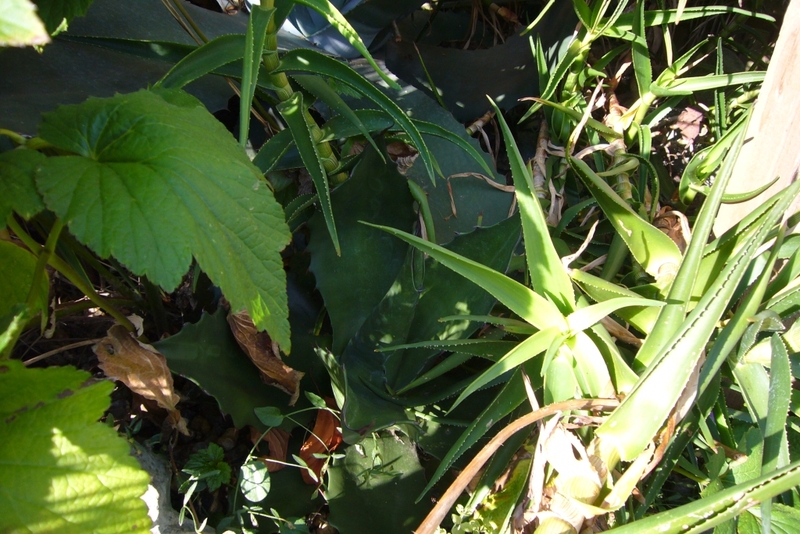 The second plant you can see in the background, it is a little strange as it has no white marks on the leaves. Neither of these have offset yet which is strange. They grow at a good rate, and don't show any signs of root problems, just no pups. They also breeze through our winters. If agave filifera refuses to produce pups, this one doesn't stop. 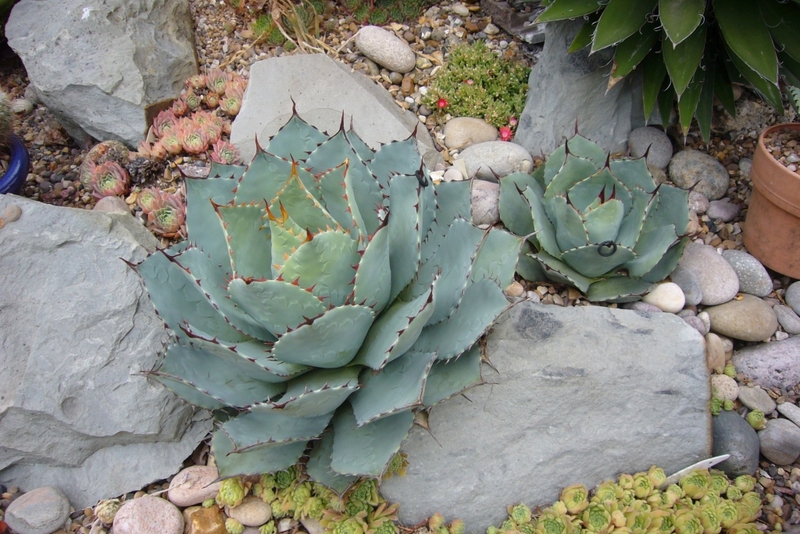 The main plant is at the top of the main succulent rockery. As the wall if often used as a seat, it is nice to have something there that doesn't stab when you sit down. As it has offset the pups have moved around the garden and given away. 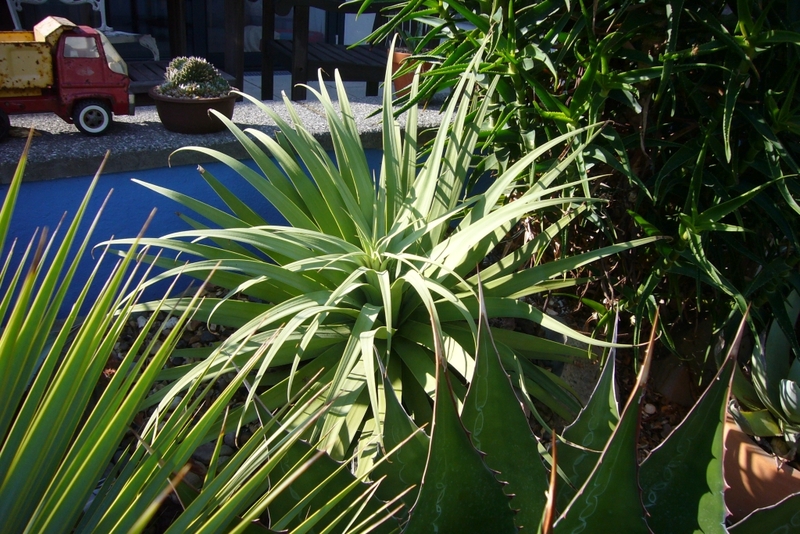 The largest is in the cycad rockery. 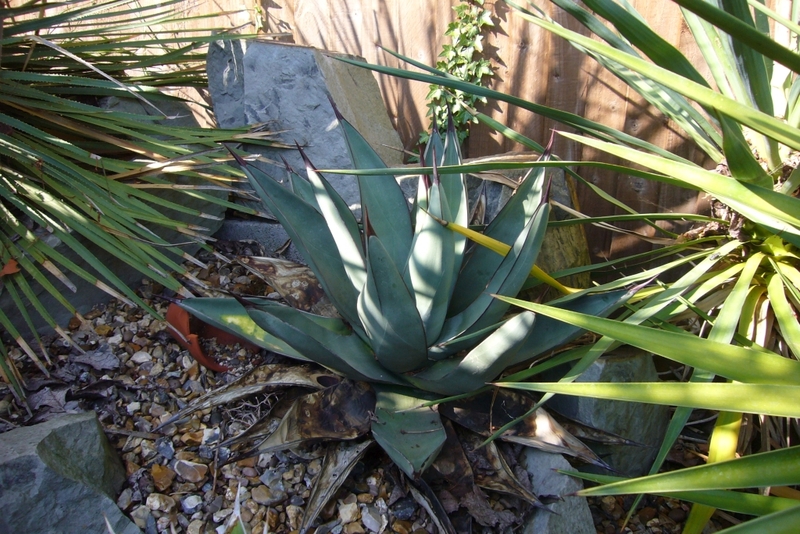 It doesn't get quite as much sun, so is slower than it's younger brother the other side of the garden. This one is much younger, but the psotion makes it a noticeably faster. Again the largest is at the top of the main rockery, not such great positioning on the seat front. It grows at an impressive rate and shrugs off the winters here. 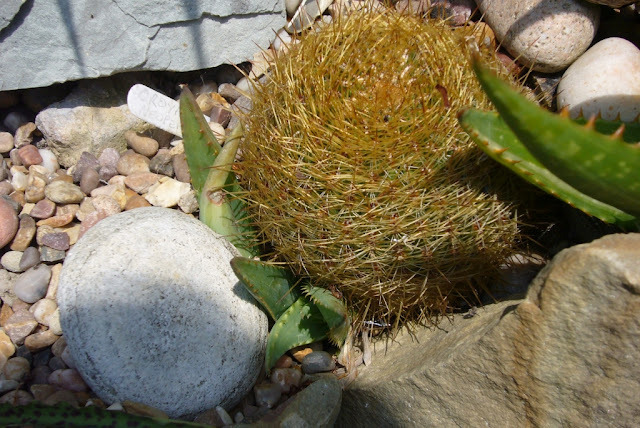 The second one in that rockery is seed grown. I only kept a few seedlings and this was the best of the bunch. It is very white in colour. 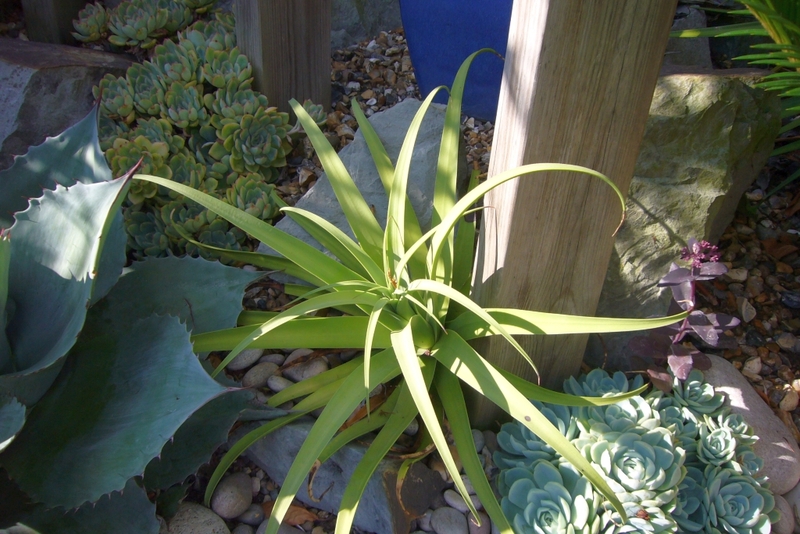 The third plant is in the front and is one of the named forms, agave ovatifolia 'Frosty Blue' . There is no doubt it is whiter than the standard form. Leaves from the near by trees, got into the crown and caused the brown spots. That wont be happening next year. This one also has wider leaves than my other two. It will be interesting to see if these differences continue as it grows. 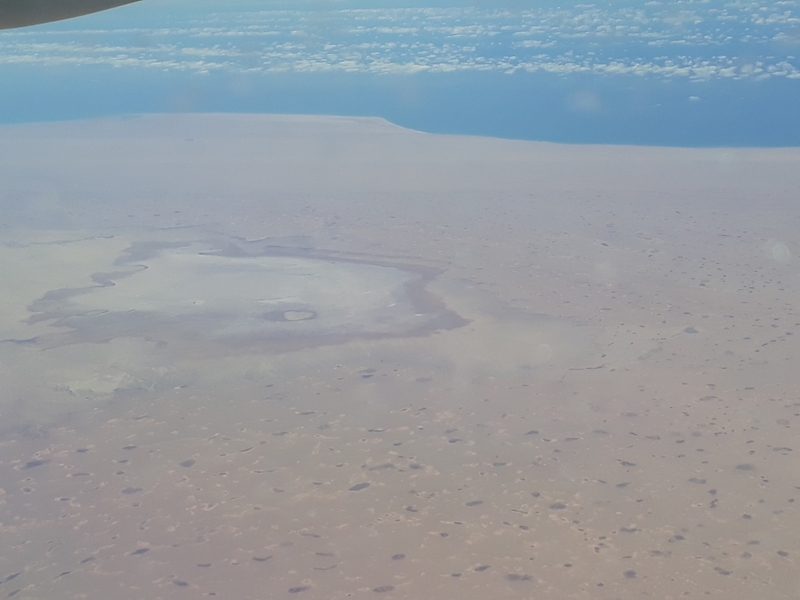 I had wondered how the position would affect this one, it gets less sun and is considerable more exposed. Apart form the leaf damage it is fine. This is one of my favourite agaves. 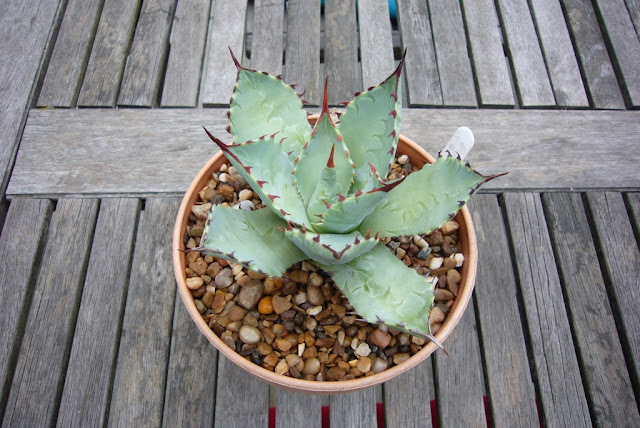 Smaller than many of the other forms but with very compact form and the spines are a great colour. It was a tiny offset when i got it and has finally started to grow properly. It may have to be moved so there is space to grow. The parryi hk1684 has one pop just out of view and this one that has been grown on in a pot. It's actually the same size as the parent when i got that one. These get a simple cloche cover over winter, mainly because i don't know where i would replace them if they were damaged. Plus it's nice to have them in perfect condition. This one has just managed to hang on in there. Every year it gets damaged by winter and then just recovers by the end of summer. It is a lovely agave, but for some reason just doesn't seem to like my garden. I tried moving one to a different location and that rotted altogether. This one is going to be dug up shortly and moved, it would be nice to have it looking better. It puts out lots of pups, so I'll probaly take one of those as a spare as well. To this in only 3 years. 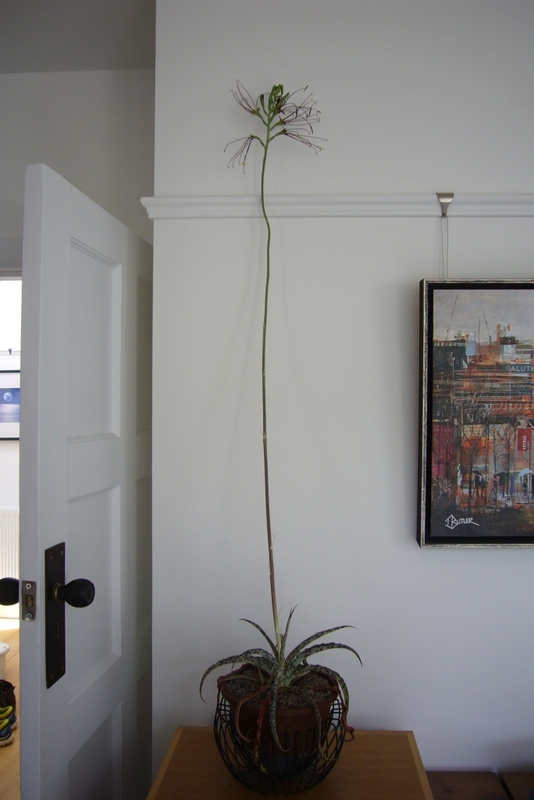 It is now well over a meter tall and almost 1.5m wide. I always knew it grew to a very large size, it's just the speed of growth that is alarming. You can see that it's been given no space and is almost in total shade. 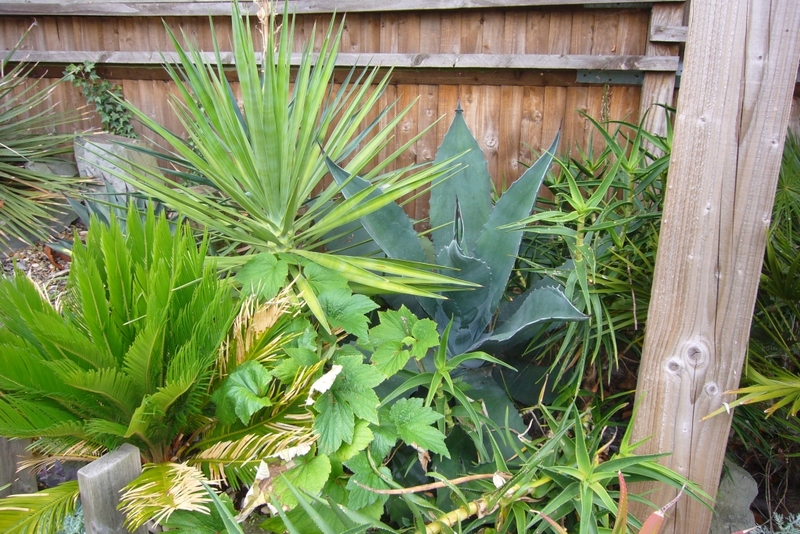 The plan for this area is to clear it, the agaves will be dug up and this one moved to somewhere else in the garden where it can be given more space. 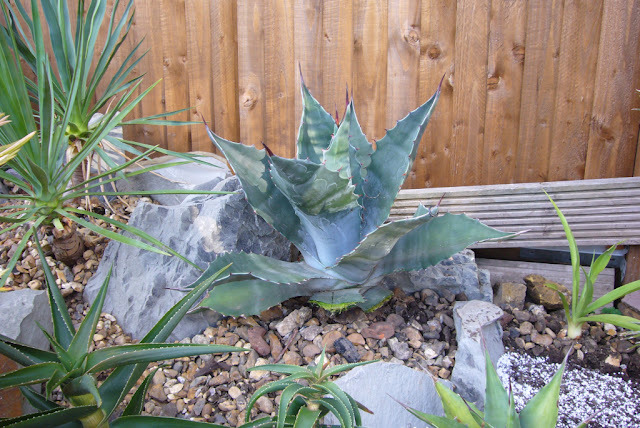 A great agave, no probalems with my winters, but think carefully before planting. I feel a little guilty about this one. It is another great agave and mine has just become swamped. It's in there somewhere. 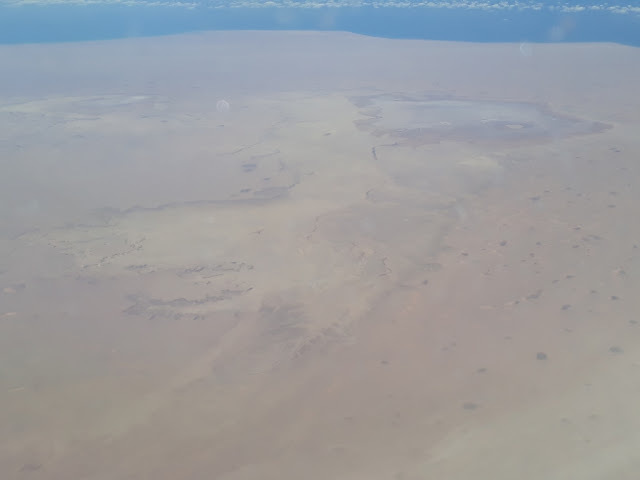 The wierd thing is, while slow it continues to grow and shows no damage despite these conditions. I have the jaws version as well in a pot, with all the planned moves in this section I'll have to decide on what to do with it. So there you have them. I did say I've limted the number of varieties in the ground. For the last year I thought I had two forms of this plant, a yellow and a white variegated form. 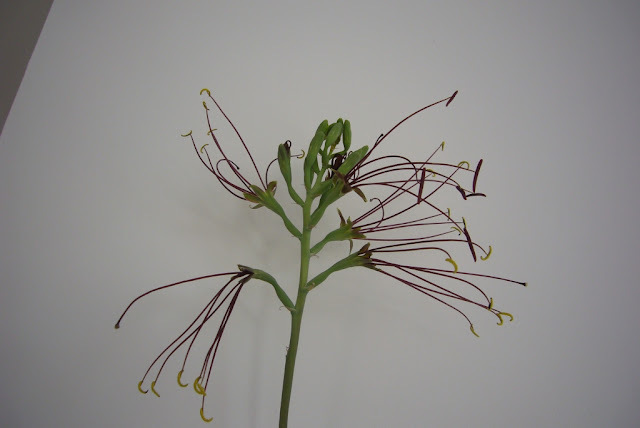 The yellow form has an amazing structure. The colour really stands out. Then the white form, is slightly smaller and the variegation not as strong (although it is stronger than it looks than the photo shows). When apart the colour looks very different. Together it is apparent that it is simply the amount of green and they're the sample colours. 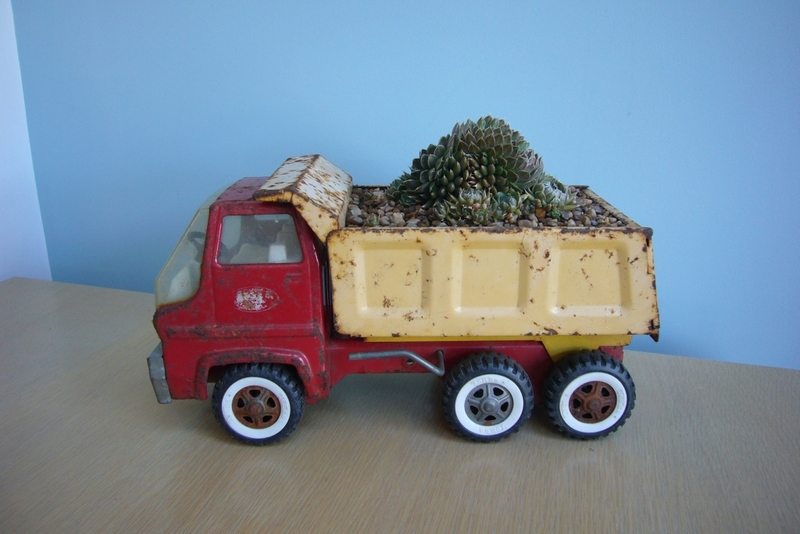 Finally got around to planting up my Tonka truck. I went back and forth over which plant to use; somethin structural, something colourful, something that will take over. 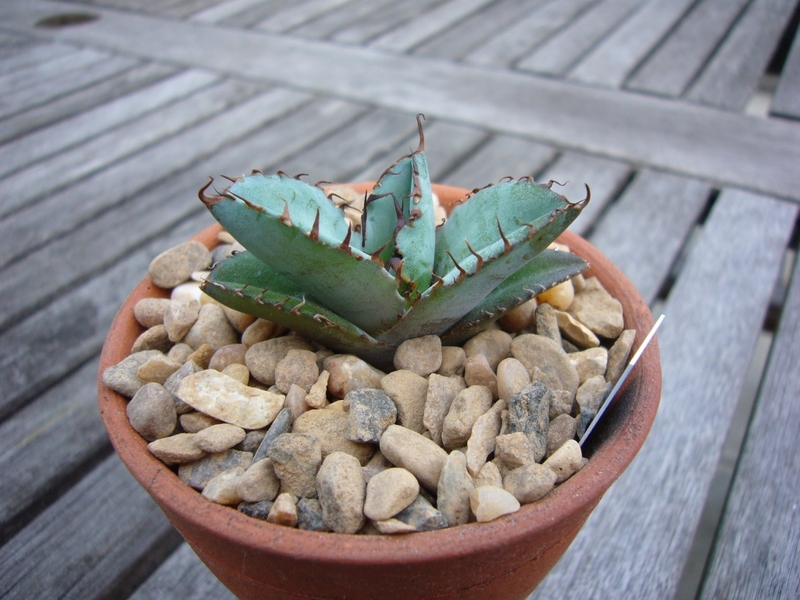 In the end I settled on orostachys spinosa, which will spread out over the surfaces. I like the way it looks like the truck is now full of rubble. 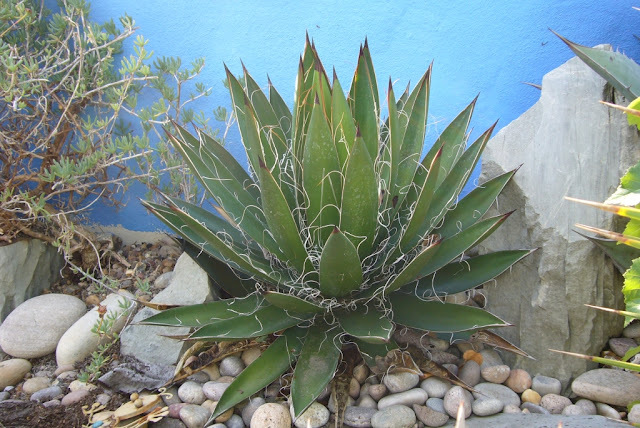 So manfredas and mangaves, what is not to like; the colour of the manfredas and the structure of agaves combined. It is strange that the plants available in the UK have not really changed in years. 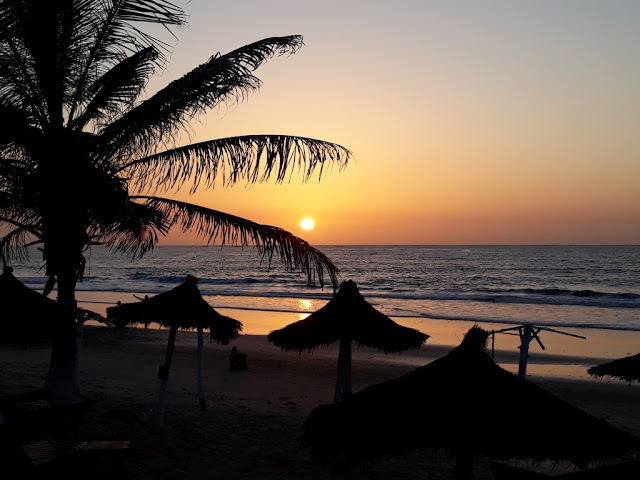 We have a good selection of manfredas with virginica, guttata, maculosa and undulata all being fairly readily available if you look for them. You can even get choice forms like undulata 'Chocolate Chips' if you search hard enough. I haven't quite sorted out the best growing conditions for my undulata 'Chocolate Chips' yet, it seems I probably grow them too much like an agave, and should give them righer soil and more water. 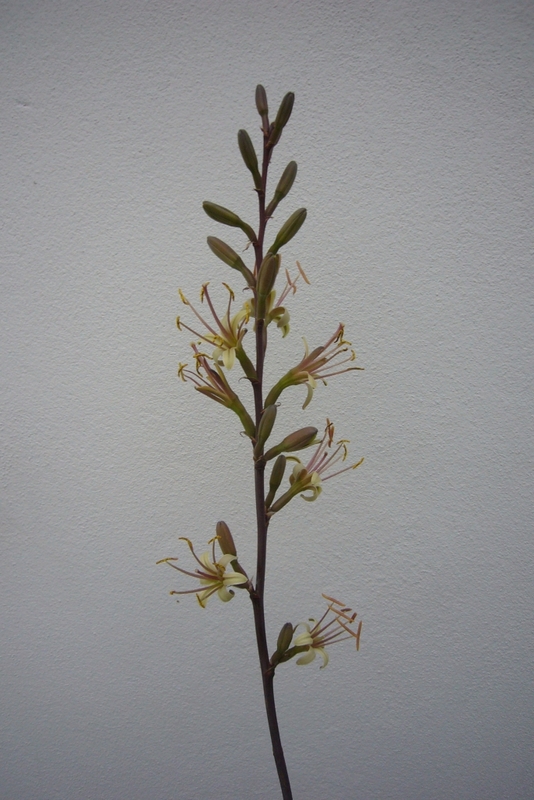 It did however flower, which is typical of manfredas; interesting but only a few flowers on the stalk. Sadly the flower was at the start of spring and I couldn't get hold of any agave pollen to cross with, so no seeds. This was really frustrating as it would be a great parent plant for mangaves. 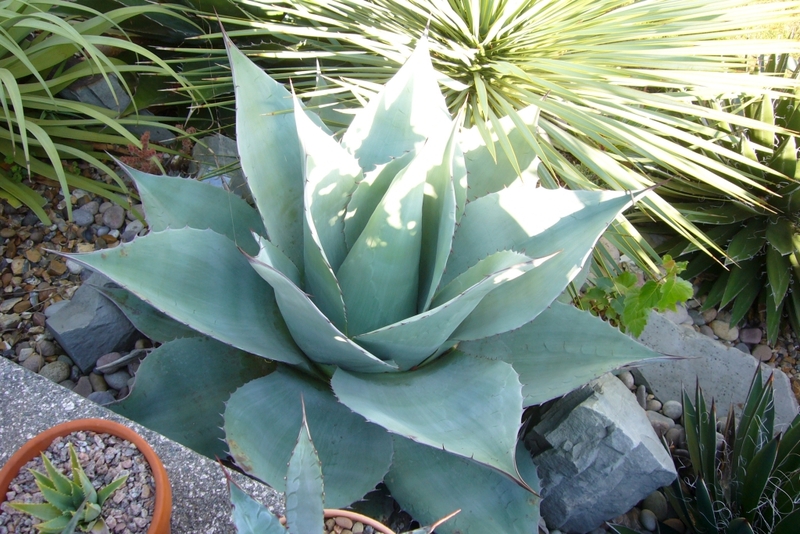 You don't grow manfredas for the flowers, it's the colour and speed of growth that make them an ideal partner for agaves. Manfreda guttata is a good example of this, and my most dramatic manfreda. This plant has offset well and there are a few decent sized pups, in the photos the pot is 30cm to give you an idea of size. 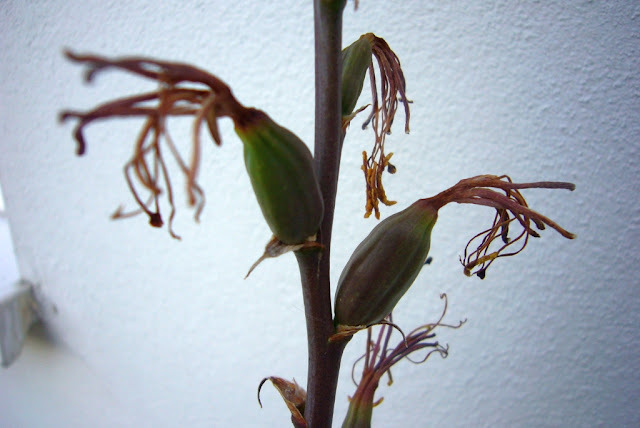 I just need it to flower at the correct time, when agave pollen is available. Or figure out if pollen can be frozen for use later. So the mangaves. 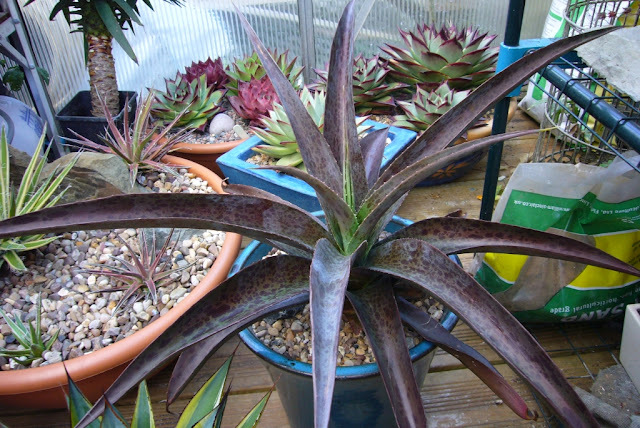 There are two main plants you can get in the UK, 'Bloodspot', and 'Macho Mocha'. My 'Bloodspot' is a work in progress. There is a variegated form of 'Macho Mocha' call 'Espresso'. I am lucky enough to have both and they pretty much behave identically. Sadly they suffered last winter and are just getting back into looking good again. The great thing about mangaves is that they quickly. 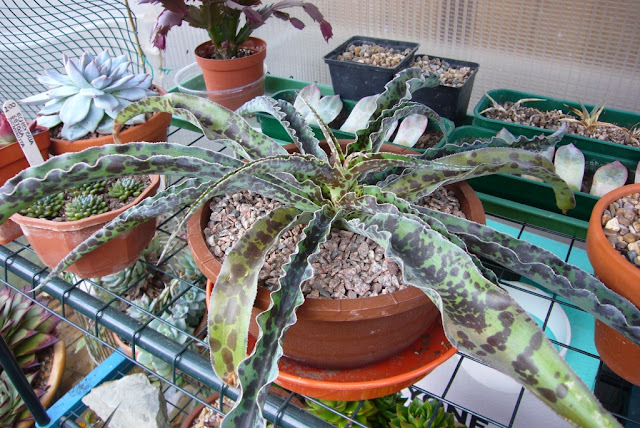 Next winter they will be brought inside as the unheated greenhouse is just too a little too cold. So if you are looking in the UK that is probably what you will find. The thing about manfredas is that they flowers readily, and even in the UK agaves flower. So ther are probaly lots of un-named mangaves out there in private collections. Again I have been lucky in that I have managed to get hold of two. 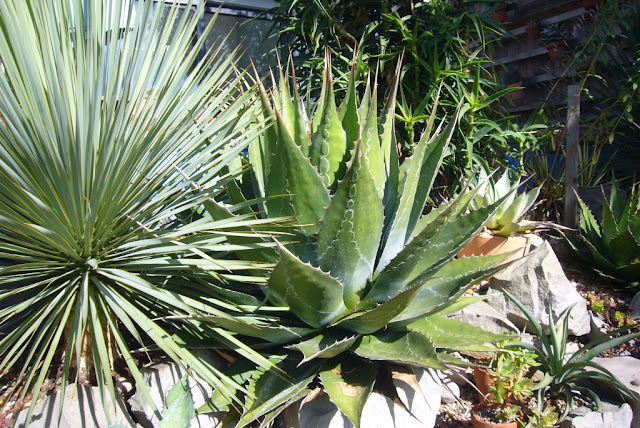 Both crosses with an agave obscura (or polyacantha var xalapensis, I forget which is the current name). One with manfreda maculosa, the other manfreda virginica. They have very different forms. 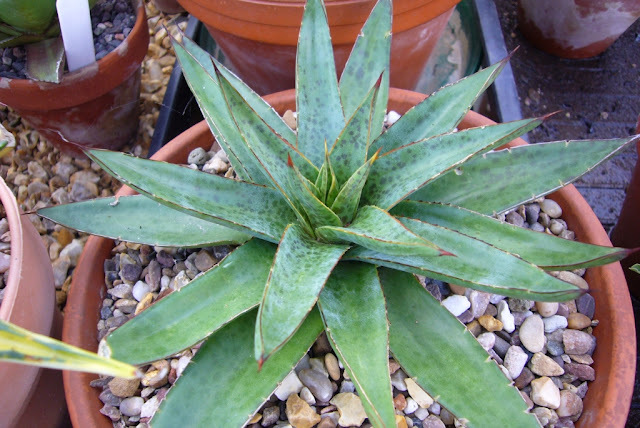 The manfreda maculosa x agave obscura have triangular sections to the leaves. It seems to offset profusely which is useful. As with many manfredas / magaves the colour depends on the light and sun levels. In direct sunlight this one is covered in spots. 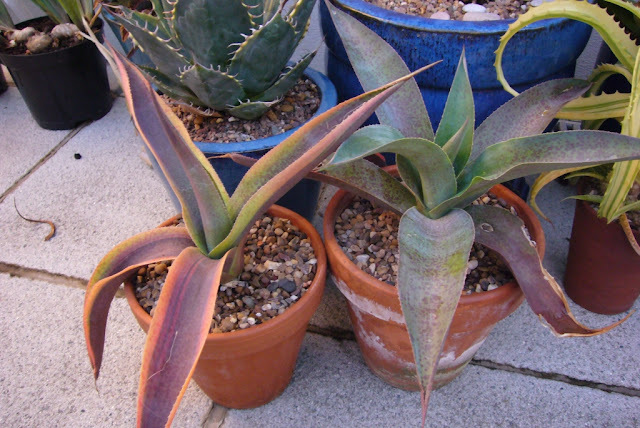 The manfreda virginica x agave obscura is more upright with softer leaves. Speaking to friends who also took pups, these were quite variable in colour and form. I had high hopes for this one, then dispite only being a few years old it flowered. At first it looked like it would be a typical manfreda flower; a few flowers on the stem. 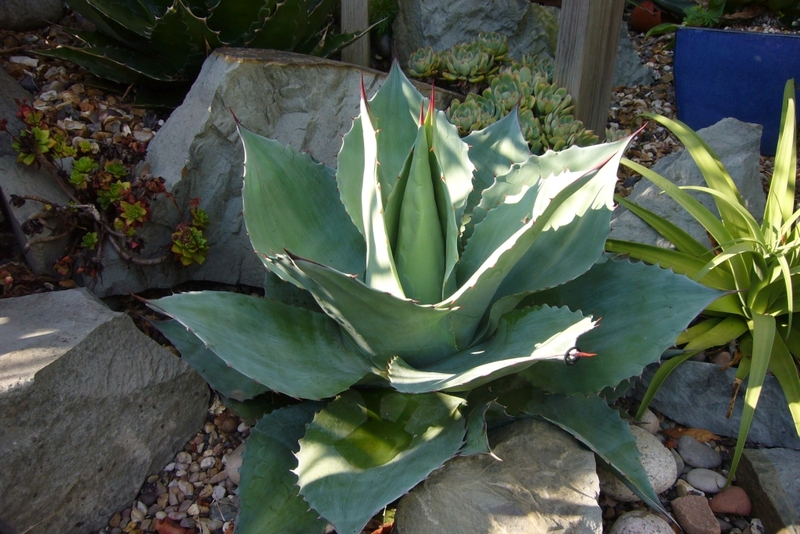 The flowers themselves are larger and typical of agaves. 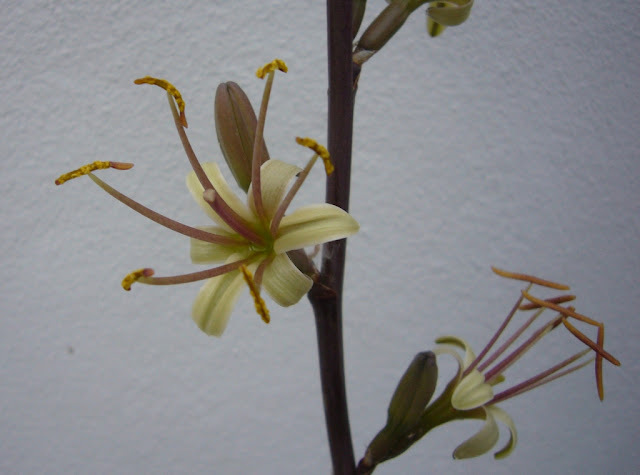 So the timing for this flower was better and a friend had 4 agaves in flower. 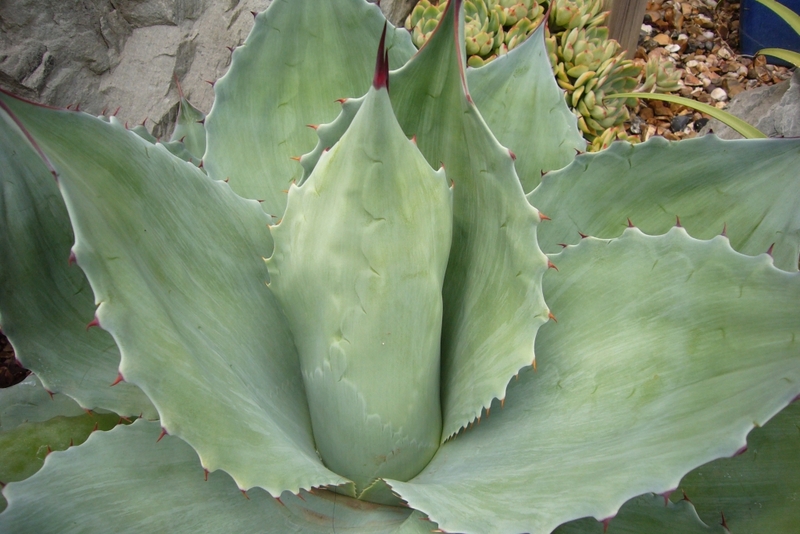 She rushed over pollen from agave mitis, and a large blue agave which has a spectacular flower. The signs are good, with at least 4 seed pods definitely taken. Obviously the issue with seeds is that they need to be germinated and grown. Me and seedlings do not go well together. 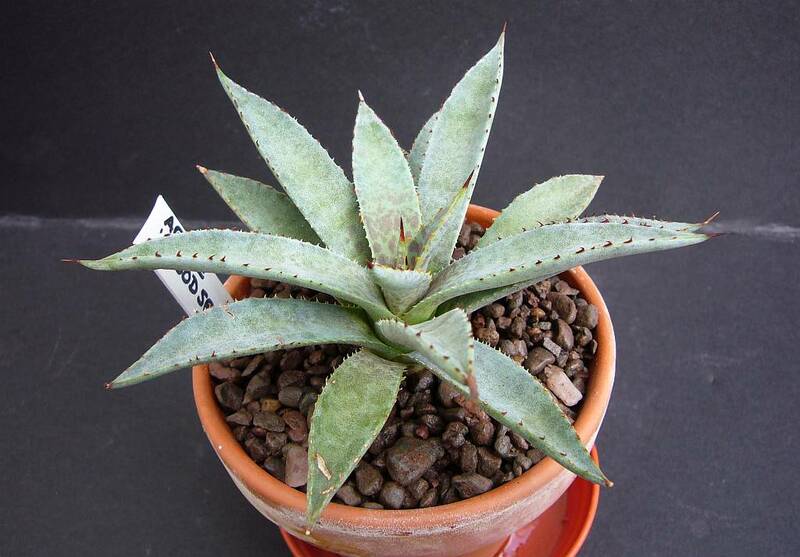 The last seed project was the aloe polyphyllas, 48 out of 50 seeds germinated, only 2 seedlings are still alive. I guess, I'll cross that bridge when I come to it. In the mean time keep your fingers crossed that the pods produce viable seeds. This summer, with the flowers and propagating my plants I have renued my search for more varieties. In the USA, there are now a lot of stunning varieties avialable. Just go to Walters Gardens Mad About Mangave page for a sample. While these are now for sale in the US, they have yet to make it over to the UK. I understand that plans are afoot to change this, but it will not beuntil for a year at least. In the mean time my search for European collectors / growers continues. If you have any manfredas or mangaves and would be interested in trading please let me know. No doubt I will keep you up to date in the seeds progress, and if you live in the US, what are you waiting for go out and buy yourself a pot of happiness. 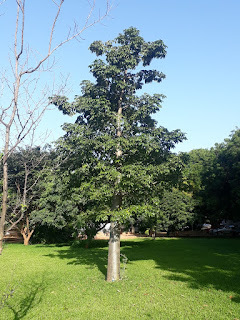 Mangaves have been in the shade for too long, this is their year to shine!